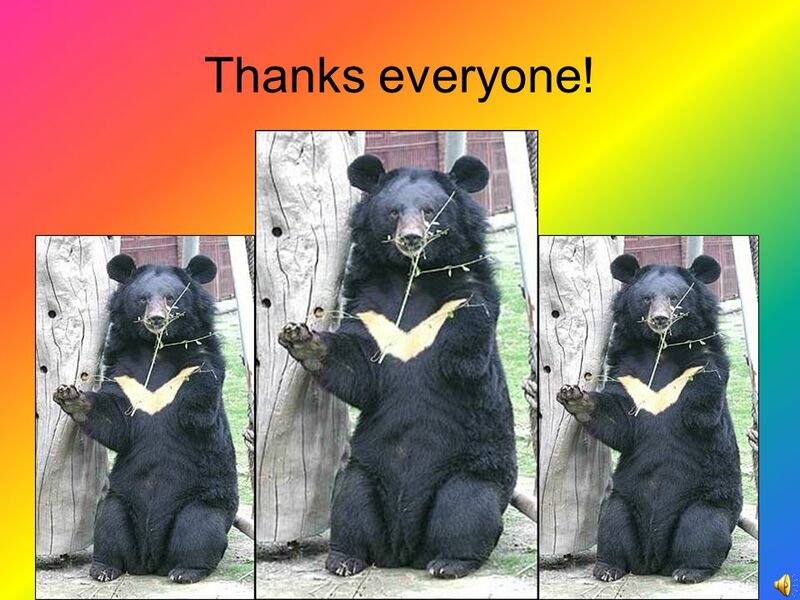 Formosan Black Bear Team name:Don’t worry Taiwan black bear's Features: Features : They are also known as "white-throated bears" because of the V- shaped. 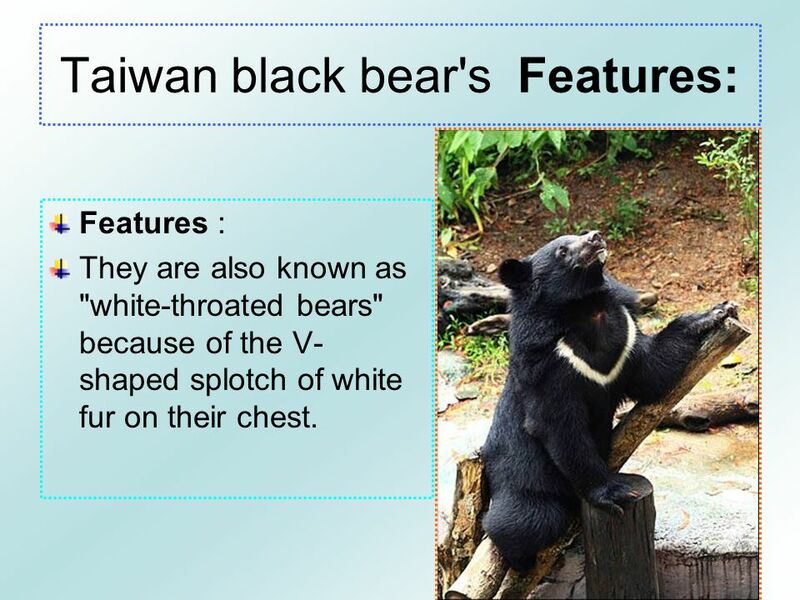 3 Taiwan black bear's Features: Features : They are also known as "white-throated bears" because of the V- shaped splotch of white fur on their chest. 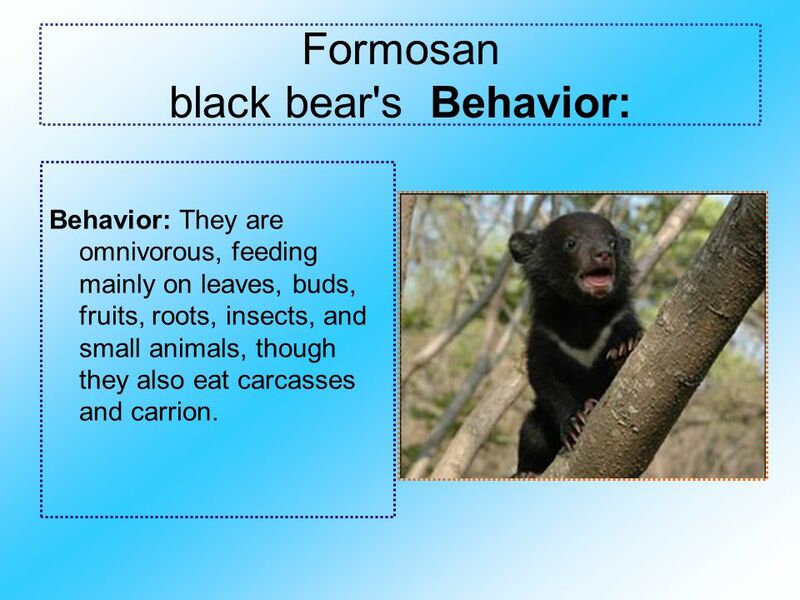 4 Formosan black bear's Behavior: Behavior: They are omnivorous, feeding mainly on leaves, buds, fruits, roots, insects, and small animals, though they also eat carcasses and carrion. 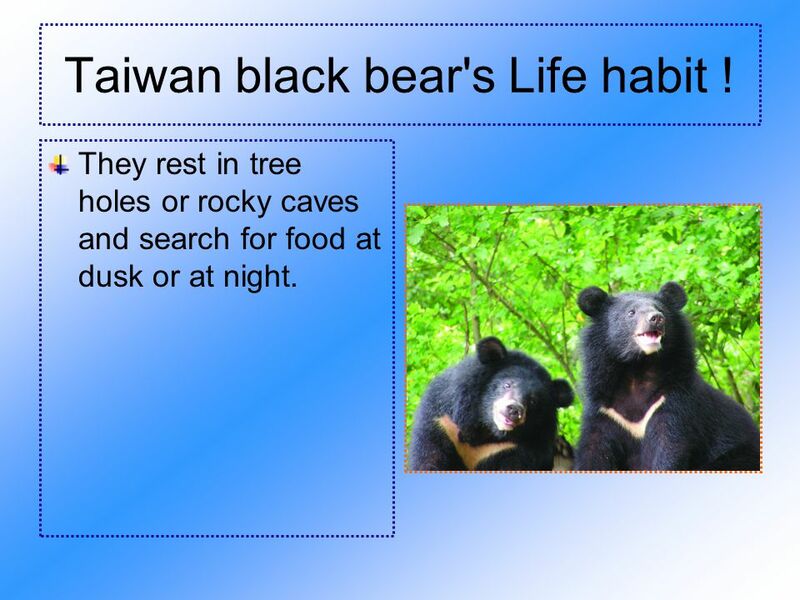 5 Taiwan black bear's Life habit ! They rest in tree holes or rocky caves and search for food at dusk or at night. 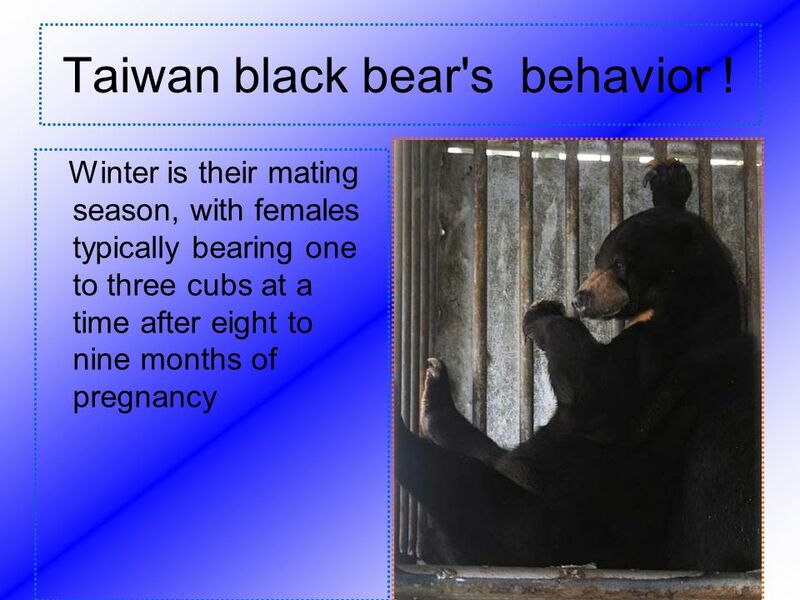 6 Taiwan black bear years Cubs become independent after one year. 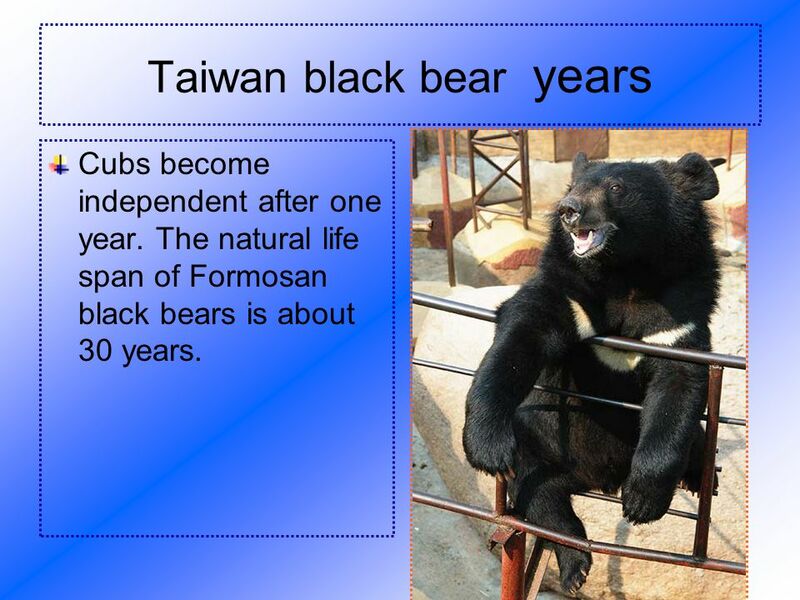 The natural life span of Formosan black bears is about 30 years. 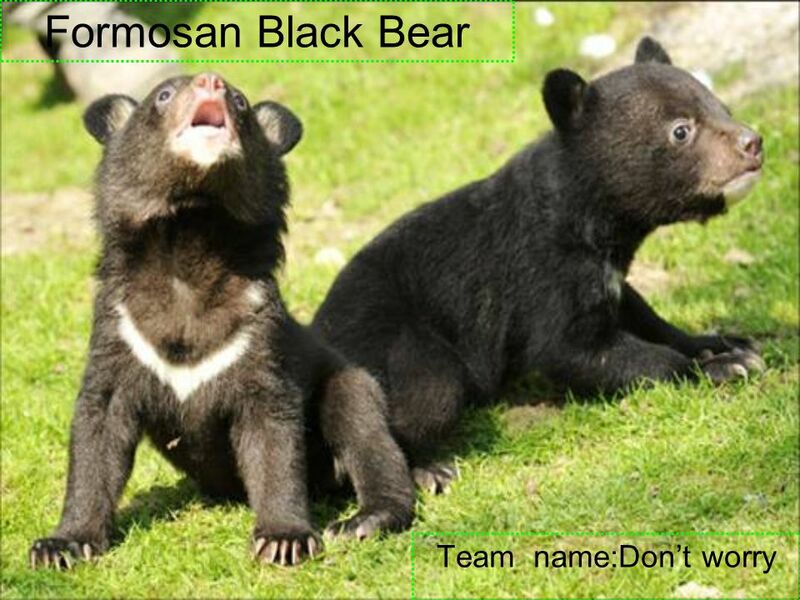 Download ppt "Formosan Black Bear Team name:Don’t worry Taiwan black bear's Features: Features : They are also known as "white-throated bears" because of the V- shaped." Three Toed Sloth By Jade Littell. By: Emily Neises And Hannah White Our Base animal  Our base animal is a panda.  Pandas are animals with white and black fur.  Pandas are endangered. The Amazing Squirrel Monkey By: Kalun White 3 rd Period. Chimpanzees By Bridget Chimpanzee’s species are pan toglytmes. That means all cave dwellers. Can you guess the name of my animal? By, Carter. Animal Group It belongs to the animal group called Mammals. Forest Webquest Deer Mouse Snowshoe Hare Great Gray Owl Beaver Moose Black Bear Gray Wolf Wolverine Red Fox Chickadee Squirrel. By: Clarke Bennett. Table of Contents 3- Little Brown Bat 4- American Beaver 5- Eastern Cottontail Rabbits 6- Eastern Gray Squirrel 7- North Eastern Coyote. Bat Facts: Bats live in every part of the world. Wild in Pennsylvania Black Bear. Introduction Have you ever wanted to learn about the magnificent life of a Black Bear? Have you ever climbed a tree? African Honey-Badgers By: Destiny. Habitat Lives in holes that a bear can fit in Live in the grasslands and forests. Red Panda by: Calvin Ines. Panda life Presented by Brandon Cameron Presented by Brandon Cameron. Brown Bear Jerry & Ethan. Black Capped Chickadees By: Emma Weiss Becca Polosky Lexus Thorn Alexis McMurray.